Cheddar cheese is a relatively hard, somewhat sharp tasting natural cheese that originated in the English village of Cheddar in Somerset. 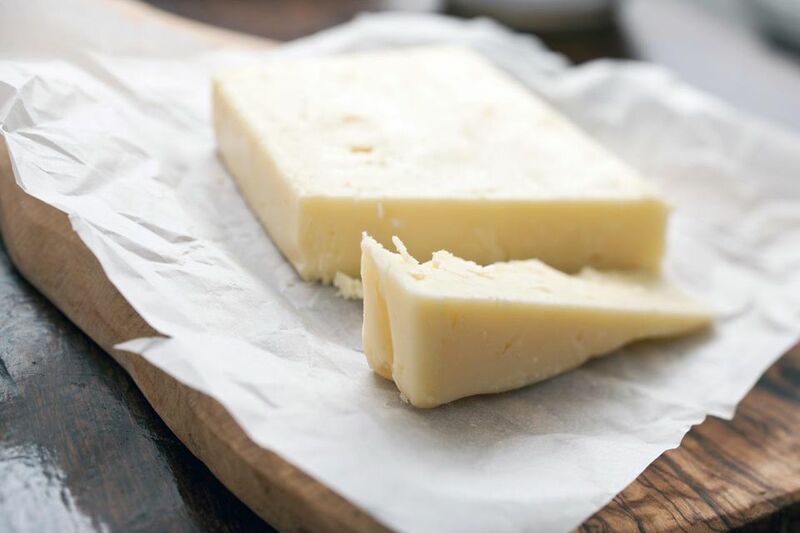 It's the most popular type of cheese in the United Kingdom, and the second-most popular cheese in the United States (right behind mozzarella). As popular as it is, you've undoubtedly noticed while browsing the refrigerated cheese section of your regular grocery store, supermarket or fancy gourmet cheese counter, that some cheddar is yellow and some are white. And you've probably wondered just what the difference is and if the flavor is different. It would be easy to assume that coming in two colors means there is something significantly different about the flavor of yellow and white cheddar or that they must be different varieties. But actually, there is no difference whatsoever, apart from the color of course. When it's produced, cheddar cheese is naturally white to light yellow in color. The dark yellow, almost orange color that is commonly seen in cheddar cheese is the result of a coloring additive. Typically the color comes from a plant extract of the achiote tree called annatto. This additive gives the naturally white cheddar cheese that deep yellow, or orange appearance that everyone associates with the cheese on cheeseburgers, grilled cheese sandwiches and, of course, macaroni and cheese. They just wouldn't look right to many Americans without that characteristic yellowish-orange color that's associated with cheddar cheese. Although the annatto coloring does not affect the cheese's taste, there are, in fact, different varieties of cheddar cheese such as mild, medium, sharp, and extra sharp. When one cheddar tastes different than another cheddar of the same or different color, it is a result of how long the cheese has been aged. The longer the cheese is aged, the sharper the flavor becomes. So mild cheddar has been aged for the shortest time and extra sharp the longest. The state of Wisconsin is definitely yellow cheddar territory. In fact, all throughout the Midwest, cheddar is thought of almost exclusively as a yellowish orange cheese. Vermont, on the other hand, leaves its cheddar natural, minus the annatto dye, and so it is white. You might notice that if some brands call their cheddar "Vermont," it's always white, and that's a bow to this tradition and identity of the region. But whether it's from Vermont or Wisconsin, the actual cheddar tastes pretty much the same regardless of color differences as long as it's the same level of sharpness, age, and quality. New York style cheddar may be either white or yellow but is always extra sharp, probably the sharpest of all the cheddar styles. America loves its cheese and cheddar shows up in so many dishes. The aforementioned cheeseburgers, grilled cheese sandwiches, various paninis with meat and cheddar, on Mexican food like nachos, and in that all-time favorite, macaroni, and cheese, as well as a multitude of pasta-based casseroles. Cheddar is a star player on potato skins, on loaded baked potatoes, and in potato casserole dishes. Many chili aficionados can't imagine eating a bowl of Big Red without shredded cheddar on top. Have you ever been served a warm slice of apple pie with a hunk of sharp cheddar on top? It's a wonderful combo. Packages of pre-shredded cheddar are for sale everywhere for those cooks who don't want to take the time to grate the cheese by hand. Note though that the pre-shredded cheeses contain cornstarch to help avoid clumping so you will get better flavor if you do the work yourself with a box grater or food processor. Everyday dishes aside, extra sharp cheddar pairs very well with robust red wines like pinot noir or cabernet sauvignon, while mild cheddar goes great with merlot or a dry white wine like chardonnay. In Middle Eastern cooking, cheese is a wonderful addition to many dishes. Cheddar cheese enhances the flavor of tuna pita sandwiches and as a topping on some varieties of hummus.